Last Thursday, NWO and several industrial partners awarded six research grants to research projects on Innovative Research. Amongst those, the ULTRA-X-TREME project, which will focus on the development of new 3D echo techniques to improve diagnosis in patients with vascular diseases. At TU/e, Richard Lopata and Marc van Sambeek from the Biomedical Engineering Department will lead the research on ultrasound and model-based clinical decision support for improved and personalized diagnosis. The NWO Innovative Research grant is meant to strengthen the connections between academia and industry. Thanks to the 28 million grant scheme awarded last Thursday, six large collaborative projects will be financed for the next six years. 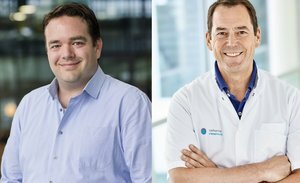 Richard Lopata, associate Professor at the Cardiovascular Biomechanics group of the Department of Biomedical Engineering, and Marc van Sambeek, part-time professor in the same group and vascular surgeon at the Catharina Hospital Eindhoven, were two of the winners with their ULTRA-X-TREME project. Rupture of abnormal plaques (atherosclerotic plaques) within blood vessels and rupturing of blood vessel walls due to the formation of large bulges (aneurysms) are among the leading causes of stroke and sudden death. To date, prevention of plaque and aneurysm rupture is based on the measurement of the restriction of the vascular lumen or of the blood vessel’s diameter by ultrasound. Many acute events are, however, not predicted by these criteria making the current screening practice highly inadequate. Thus, several patients still undergo unnecessarily risky treatments while dangerous cases are missed. The ULTRA-X-TREME project aims at the development of innovative, fully 3D ultrasound methods to quantify blood flow and measure the blood vessel wall and plaque properties at unprecedented resolution, and in combination with patient-specific biomechanical models. Within the ULTRA-X-TREME consortium - which includes the best Dutch research groups on ultrasound, hospitals, and industrial partners - Richard Lopata will lead the research on ultrasound-based and model-based clinical decision support for improved and personalized diagnosis. Clinical pilots will be performed in collaboration with Marc van Sambeek. The ULTRA-X-TREME project was awarded with a total budget of 3.9 million euros. Part of the grant (approximately 650 000 euros) will be used by Lopata and his collaborators to finance two PhD students, and to gain new infrastructures and equipment for the PULS/e laboratory.